Who is that woman in your life? You know the decidedly feminine one with a vanity not filled with a ton of 'cheap' scents but one classic one? One Vanity worthy beautiful bottle of her signature scent? The women in my family all have very different senses of style, but are all very feminine and in many ways romantics at heart. As a girl I used to love watching my Mom get ready to go out, I was amazed by her ritual which always ended with her 'walking into' her scent. As for me, it's hard to find a women's fragrance that doesn't go over the top with the florals to prove it's feminine and that has always been my biggest issue with women's fragrance. What use is beautiful packaging if the fragrance inside doesn't meet the mark? Creating a fragrance is an art, finding your signature scent is certainly a journey, and the memories you create wearing it is the icing on the cake as far as I'm concerned! 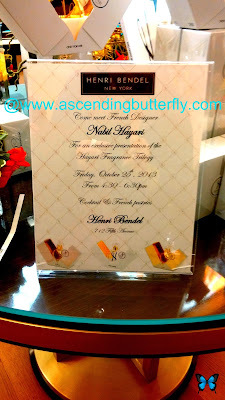 I recently had the opportunity to attend the launch of Hayari Parfums Paris debut at fine shopping retailer Henri Bendel in New York City. I knew if the House of 'Hayari Couture' was behind this trio of luxury fragrances that the packaging would certainly be beautiful and it did not disappoint, but what stands out is how ultra-feminine the trio really is. They are feminine in a way that harkens to old world romance, back to true sensuality, not just the sexuality that is used to sell everything under the sun now a days! Created by 'the nose' behind 3 of Killian's perfumes, this unique scent pays homage to French Classic Elegance! The inspiration for this fragrance (my personal favorite of the trio by the way) is embroidery and lace, which designer Nabil Hayari of the House of Hayari uses within his collections as they are the most elegant and glamorous of textiles. (I have a strong feeling my Grand-Mother would have loved this one as much as I do as her embroidery was very much top notch and she would have loved the back story on this scent!). I am also very partial to the Sandalwood and Amber combo! This is a woody-powdery fragrance created by the nose behind Amouage Memoir Women inspired by glamorous vintage couture (which of course speaks to Nabil Hayari's background as a Couture Fashion Designer!). This is the scent that I received and as I love White Jasmine, Sandalwood and Cedarwood I do like Goldy (but I am a bit more partial to the way Broderie 'dies down' on my body chemistry), Goldy really does marry a combination of singular elements well, it is actually even parts Woody, Powdery and a subtle warm Oriental all at once which means your chemistry may play up one element more than the others, for some reason this one on me remains powdery making it very playful and soft so don't be put off by the 'woody-powder' description it really isn't too much of one or the other but a very smart marriage of the two! Drawn to the world of Fashion at a very early age, Mr. Hayari decided to create his own label in 2009, with a mission of bringing to life the type of gowns women dream of wearing. 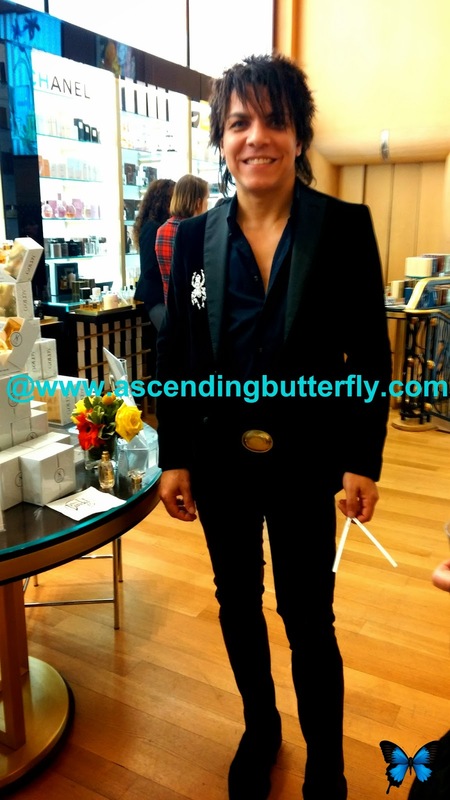 He has dressed Top Models and Princesses, and now with his line of fragrances in their 'blossom' designed packaging combining the faceting of jewels with the softness of a flower opening, he brings his sense of luxe fashion design to the world of fine fragrance. Nabil Hayari debuts Hayari Parfums Paris at Henri Bendel in New York City, Isn't this Couture Gown lovely? 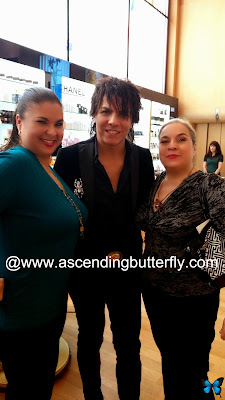 Nabil Hayari debuts Hayari Parfums Paris at Henri Bendel in New York City pictured with Team Butterfly! Left: ME! Ascending Butterfly and Right: Mama Butterfly! These are all ultra-feminine, sensual and romantic fragrances that are Vanity Worthy to say the least! These luxe scents are a must for holiday gift giving. (Although any occassion like a birthday and certainly for Valentine's Day would work too!). There was no time to get this in our Holiday Buying Guide for a giveaway, but hopefully we can bring you something fun for our annual Valentine's 'Love' Guide in February! In the meantime don't forget to get social using the links below and let them know you saw Hayari Parfums Paris featured on Ascending Butterfly and that you'd love to see a reader giveaway soon! Ƹ̵̡Ӝ̵̨̄Ʒ - Follow @HenriBendel on Twitter too! Butterflies, Which scent resonates with you most? Why? Bloggers, as usual, I'm not so Wordless, but please feel free to link up your Wordless Wednesday Photo's as a comment to this post so we can all visit your site today too! FTC Disclosure: This is an event recap, this is NOT a sponsored or compensated post. All opinions are 100% my own. A sample of Goldy Parfum by Hayari was provided to Ascending Butterfly for Editorial Consideration. I am disclosing this in accordance with the Federal Trade Commission 16 CFR, Part 255 - Guides Concerning the use of endorsements and testimonials in advertising, you may visit our full giveaway and disclosure page for complete policy information. Mr.Hayari seems to have a handle on what makes a women feel beautiful lovely cloths and a scent that brings out dreamer in us.!! KUDOS !! @Big Happy Buddha - Definitely, these are a true tribute to a woman's femininity! @Kristin Aquariann - I will say I'm pretty picky when it comes to scents and we have featured very few since we launched because of it. These are so super feminine without being clawing! I haven't been to a Bath & Body Works in AGES, you've got me thinking I should head in there the next time I pass one!